Hi everyone, its a little embarassing since I work as a mechanic, but this car got me stumped. Theoretically, I can just replace everything, but I try not to be a part swapper, I try to do the right thing. So the 2001 Olds Intrigue 3.5L came in with a no ac complaint. I recovered the 134 and found it to be a little low. Its supposed to have 35 oz., and it had about 28 oz. So I put it under vacuum and found no leaks. Recharged it, compressor kicks on and low pressure sky rockets! It hits about 325 on the low side and the compressor never cycles off. As soon as I shut the ac off it maxes out the gauge on the machine to 350. High side seems to be normal though. Any help would be much appreciated. Also all readings and charging was done on a SnapOn ac machine, no cans. Low side guage wont read that high- is scaled seperately-- but I do believe you are pegged- so that is a firm indicator of air in the system- Your refrigerant tank on your scale has air in it--your air bleeder vent is probably not working due to valve depressor not being depressed because you have the air hose on backwards-- check it out- it could happen to anyone who is not careful and understands their equipment. Hi thanks for responding. On my snap on kool kare plus machine, the low side gauge does go up to 350. And what air hose are you referring to? The only hoses I've touched on the machine have been the ones that attach to the service ports. And also the machine worked fine on another car after this one. But I will have the snap on guy take a look at it anyway. So pressure situation aside, what would keep the compressor to never cycle off and still have no cold air? Can only visualize the orifice is solidly blocked, but can't even visualize why the low side is greater than the high side. Not easy to reverse the lines to R-134a ports, but never really tried to. 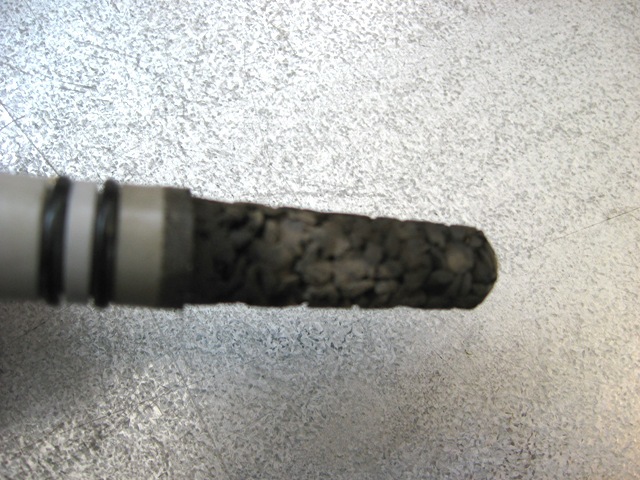 This iimage is from a unit removed from a late model GM with app 100k miles. The compressor (V series) was operational but clutch had begun to indicate possible heat issues (extra head pressures).